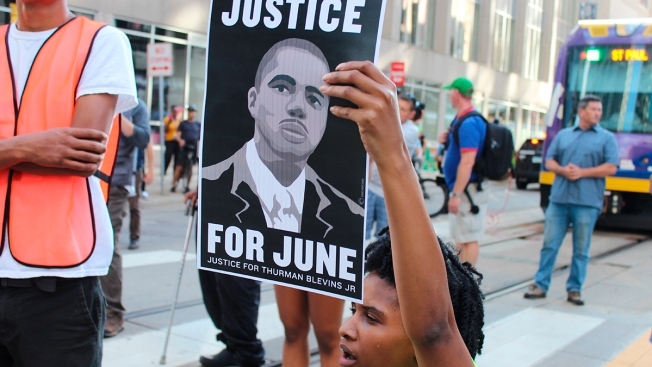 A man holds a sign with a picture of Thurman "June" Blevins during a protest in downtown Minneapolis, July 31, 2018, over a prosecutor's decision not to charge two police officers who fatally shot Blevins last month. Thurman Blevins, 31, was shot June 23 by Minneapolis officers after they chased him into an alley. The officers were responding to a 911 call of a man firing a gun into the air. Body cam video shows officers pulling up near Blevins as he sat on a curb. Police said he was holding a gun and didn't follow commands. Activists and family members of a black man who was fatally shot by Minneapolis police marched through downtown Tuesday, blocking trains and intersections during the evening rush hour as they chanted some of Thurman Blevins' last words: "Please don't shoot me! Leave me alone!" The City of Minneapolis released body camera footage showing Minneapolis police officers Justin Schmidt and Ryan Kelly chasing and fatally shooting Thurman Blevins on June 23, 2018. Footage stabilized by the National Center for Audio & Video Forensics show what appears to be a gun in Blevins' left hand during the chase. Blevins' family members said he wasn't a danger while he was running away. His sister, Darlynn Blevins, said her brother "ran for his life" because he was scared and the officer "emptied his clip into my brother's back." Sydnee Brown, Blevins' cousin, said Thurman Blevins "was not an evil man walking the earth." Demonstrators shouted that Freeman "needs to go." They carried signs that called for justice and chanted, "No justice, no peace, no racist police." There was a brief confrontation with a woman who was upset that her train was delayed, but otherwise the protest was peaceful. The officers were responding to a 911 call of a man firing a gun into the air. Body camera video released Sunday shows Schmidt and Kelly pulling their cruiser up and Blevins seated on a curb near a woman with a child in a stroller. As the officers pull up, one says, "He's got a gun!" and they jump from the squad car. The officers chase Blevins and shout at him to put his hands up or they will shoot. Blevins says, "Please don't shoot" and "Leave me alone." An enhanced version of the videos has a red circle drawn around what appears to be a gun in Blevins' right hand. The video shows it come into view as he looks over his left shoulder at the officers, before he is shot.